An estimated 8 million babies weighing less than 2.5 kilograms (or 5.5 pounds) – called low birth weight (LBW) – are born every year in India. It is also estimated that up to 92 percent of all newborns are affected by hypothermia, with greater incidence in LBW babies. Hypothermia and infection are among the top causes of newborn death and illness in resource-poor settings, and newborns with hypothermia are likely to face issues of poor weight gain, hypoxia, hypoglycemia and even death. Preventing hypothermia is recognized as an essential part of care for all newborns by the World Health Organization and the Indian government. However, hypothermia is often missed, especially in clinics where nurses are few and in homes where parents are uneducated or unaware. While growing up in the U.S., Ratul Narain traveled to visit his family in India, where he saw firsthand the disparity in quality of life that exists there. After receiving his bachelor’s and master’s degrees in engineering from Stanford and building cardiovascular medical devices at Johnson & Johnson for seven years, Narain decided it was time for his next step. He moved to India where he joined Embrace Innovations as a fellow in Bangalore to help build warming devices for newborns. Once the fellowship ended, Narain still had something inside of him pushing him to do more. He spent a year in the field meeting with more than 100 pediatricians and neonatologists around India to learn more about the true problems in newborn health care,working with doctors to brainstorm solutions, and then building, testing and distributing innovative health tech ideas. 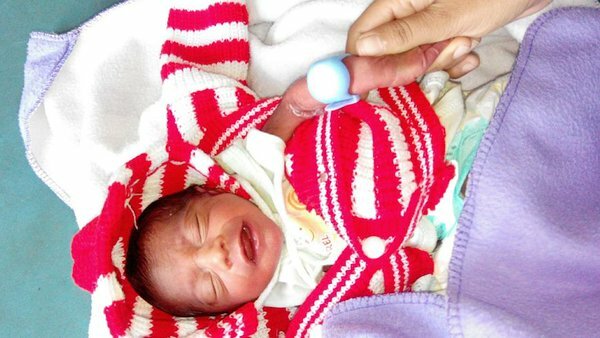 In November 2014, one of Narain’s ideas – the Bempu bracelet, designed to empower nurses and parents to detect and prevent hypothermia in babies – was awarded a grant from the Bill and Melinda Gates Foundation. The bracelet is easy to use and requires minimal training: Care-givers pull a tab to activate it, then place it on the baby’s wrist. After five minutes, if the baby is warm, the bracelet’s blue light blinks every 30 seconds. If the baby gets too cold, the bracelet sounds an alarm and blinks orange. It’s designed to work 24 hours a day for four full weeks. The device’s intuitive audiovisual alarm was built to ensure that even illiterate parents are able to understand the alarm and take corrective actions. Within 10 months, the team saved their first life as part of a clinical study where they were piloting the Bempu device. And within a year of funding, the team launched the Bempu bracelet in the Indian market. Bempu is a for-profit social enterprise that uses market forces to scale its impact across India’s neonatal health system. As of last month, the bracelet has been used in 150 private-sector centers across India. In addition, the company is in the process ofgovernment pilots in multiple states across India with the end goal of government procurement. There is nothing like the Bempu bracelet in the current market – it is the only continuous hypothermia monitoring and alert device available. The Bempu bracelet can be found in many settings, from high-end hospitals like Cloud Nine Gurgaon to primary health centers, and among accredited social health activists (ASHAs) – local women trained to act as health educators and promoters – in Jharkhand. Soon Bempu hopes to expand through neonatal channels in Southeast Asia and Africa. As head of public health and partnerships at Bempu, I believe we’ve been very fortunate to progress so quickly. One of the main reasons is because we have an amazing and dedicated team. Another reason is that we have incredible support from doctors who have used our device, health organizations in India and around the world, and from our mentors and partners. We specifically have benefitted from our mentors’ and partners’ networking ability.